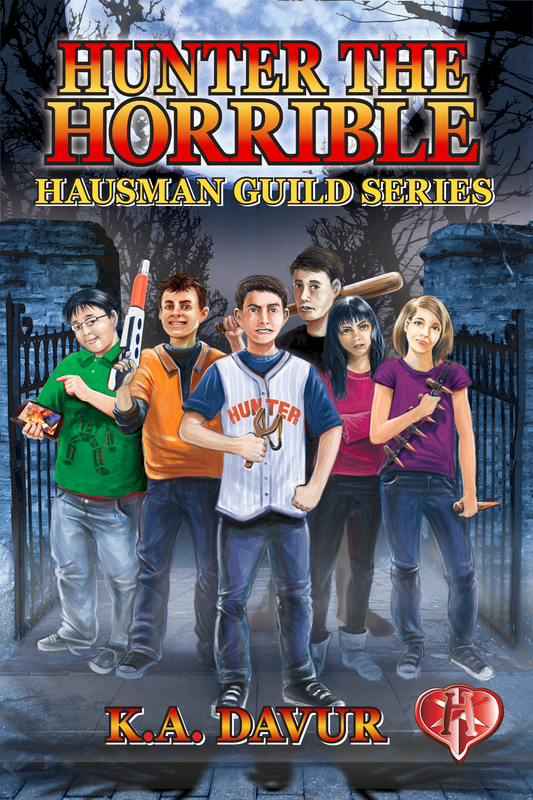 Hunter the Horrible is the new novel from Hydra Publications author, K.A. DaVur. Hunter the Horrible is a middle grade thriller due for release from Hydra in July. “I think there’s something wrong with Miss Hunter.” With that sentence six children are inducted into a mysterious organization that has been covertly fighting the undead for centuries. Of course, they don’t know that. All they know is that their creepy new teacher, the one who falls asleep in class, trips kids with her staff, and always smells a little like very old dirt, needs to go. However, when a note is passed around the room, signed only by the mysterious StakesandStones,” she and her classmates set out to prove the truth: that Miss Hunter is not just cold-hearted, but cold-blooded. Hilarious mishaps abound as Jack O’Helsing, Clara Summers, Tony Brooks-Rizzoni, Peyton Edwards, and Mackenzie Selene each take a turn to prove their theory but end up only in detention. With his friends grounded for life it’s up to video game junkie Matt Kau, the class brain who knows everything except why he can’t seem to make friends, to come to the rescue. On Halloween, lit by a harvest moon, one of their plans actually goes right and the Horrible Miss Hunter is left suspended in a net eight feet above the ground. That, unfortunately, is when the real vampires attack. Can six scared kids, one trained warrior of a teacher, and two surprising allies come together in time to save the town, and their necks? And now for a little bit about the mysterious K.A. DaVur. K.A. DaVur was born and raised in an extremely haunted house near the wild and wooded banks of Lake Michigan. She won her first writing competition at the age of six and has never looked back, filling a seemingly endless series of notebooks and journals with fantastical stories and even a poem or two. She next attended Transylvania University in Lexington, Kentucky, the only university in the United States to boast no less than two former faculty members entombed under the steps of the administration building. After completing her studies, Ms. DaVur met the man who was everything she never knew she always wanted, and was engaged within six weeks. Before settling down as a full time wife and mom, K.A. worked as a belly dance instructor, midwife, and therapist in a residential mental facility, all of which gave her wonderful stories and not a few nightmares. Her first book to be published was Meanwhile Miles, a picture book about a little boy whose daydreams keep backfiring until he is saved each time by the magic of the word “meanwhile.” Ms. DaVur has traveled extensively throughout the Midwest leading writing workshops based on that book at youth camps, elementary schools, and children’s museums. 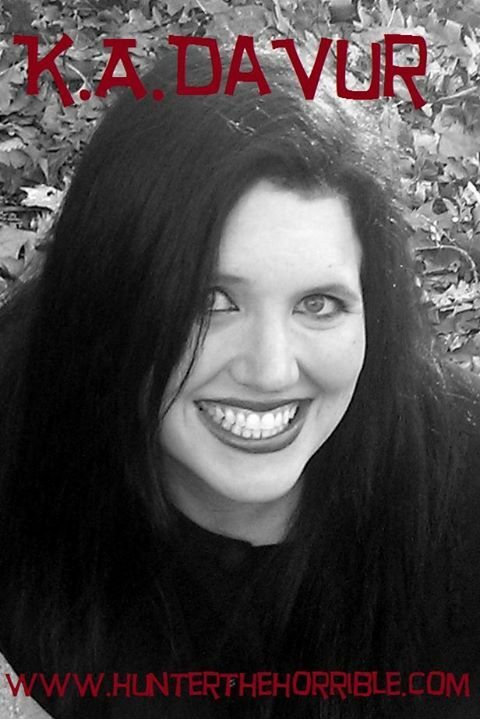 Now, she lives in Indiana where she enjoys writing novels, working on her hobby farm and homeschooling her four miniature vampire stalkers. Other obsessions include Edmund Blair Leighton art, sharks, dismantling antique machinery to make steampunk goodies, and anything Firefly. Said stalkers range from one year to eight and are known as Fat Baby, Bean, Diesel, and the Ragin’ Asian in ascending order. They are the absolute joys of her life.